We recently spent time learning and having loads of fun with Owls. The kids really got into this topic, considering that seeing an owl in the wild for us here is pretty rare, they were really very engaged. 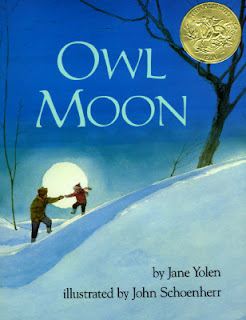 We read the delightful story of Owl Moon on several occasions. Heading out into the moonlight on a snowy winters night is not something that my kids will get to experience any time soon, so this was quite a magical way for us to experience this through the story. We completed some of the lapbooking activities found over at Homeschool Share. I hope to post on that one soon. 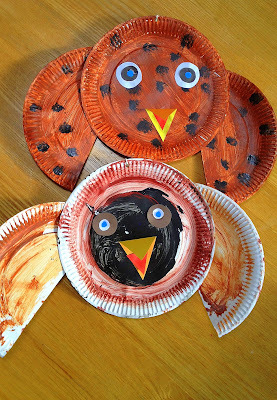 I found these super cute Paper Plate Owls online and knew we had to make some. They look great hanging from the ceiling and would have to be one of the simplest crafts we've done. Owl Babies by Martin Wardell, this is a truly delightful story and whilst aimed at the younger crowd I'm fortunate enough to have an 11 year old that can still see the beauty in such a story. This fabulous little guy is thanks to my delightful friend that played with us as we learned about owls. Once again a simple craft, found via google, but very effective. Although the help of a glue gun for this one is quite useful! 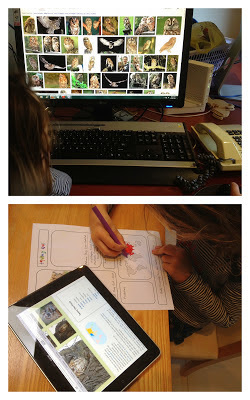 They each researched an owl of choice using the internet. Generally after a little looking around we tend to always come back to our favourite sites for animal research, Wikipedia and Animals A-Z. I have been very pleasantly surprised as to the level of enthusiasm the kids have with these research documents. It's wonderful too watch. 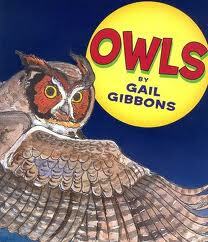 We read Owls by Gail Gibbons. Yet another informative and interesting book by Gail. A couple of the pages focus mainly on American Owls, which is expected, but thought I should mention for any Australian readers. This book is full of facts and information presented with great illustrations. 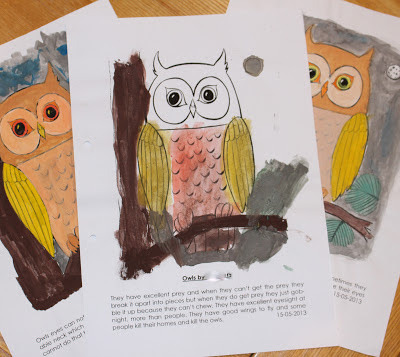 Each of the kids water coloured an owl page and gave a brief narration on some of what they learned about owls. We still have some work to do on narrations, but they are improving and making progress in this area. I purchased an Owl Puke kit for each of them to dissect. This was a little bit gross, but a whole lot of fun too! I would have to put it up there as something every child should do. The oohs and ahhs were running hot during the dissecting. Whilst we have completed the dissection and found what creatures were devoured by our owls, I would love to reconstruct the skeletons. It's a big job as the pieces are so tiny and fine. Will see how we go. Finally we rounded it all out with some art, as we always try to do with our units. Fairy Princess 8 was very proud of this piece and so am I. Not necessarily for the finished product, but for her stamina and perseverance. She spent a great deal of time working on this, made a huge effort when it came to filling the entire page and finished with a smile. Often her art attempts end up in tears as what she has in her head isn't replicated on her paper. We've been spending a great deal of time talking about this and I think those discussions are starting to pay off. Owls are such interesting creatures, we all learned so much from our time spent exploring them. 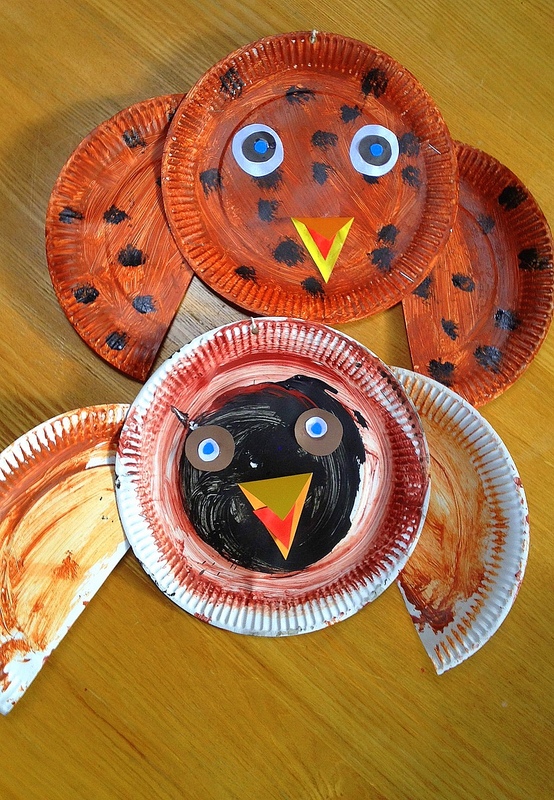 >>> Check out my Owl Themed Pinterest board for lots of ideas and links. >>> Download the Animal Notebooking pages by clicking here. 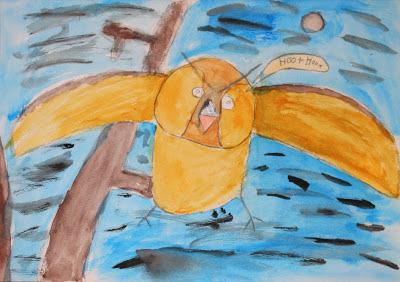 Your daughter did an amazing job on the owl painting! Looks like you had fun doing this. I might have to borrow your idea and try the Owl Puke Kit. I think my kids would have a blast with it. 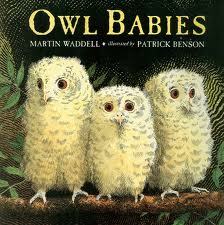 We love the Owl Babies book, but haven't read the other ones. Love your paper plate own craft. Where did you get your owl puke kit? That sounds so awesome! 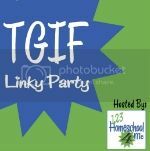 Another mom I know IRL did something similar and I always thought it would be fun for my kids. Great to know that you can have owl puke sent to Australia via BD. Thanks for the heads up. I know some nephews who'd love that!! 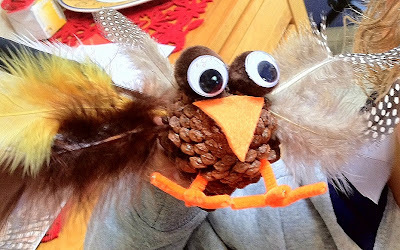 I love all your owl crafts! Each one is really special. 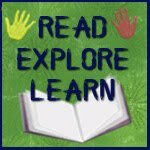 Thank you for sharing this post on Read.Explore. Learn. I will be sharing this post. 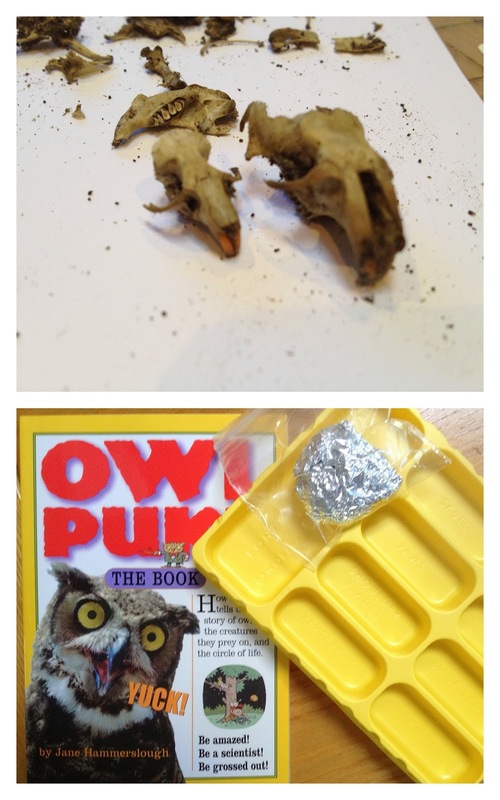 You found a real owl pellet to dissect? I wanted to do that when we studied owls, but the ones I found were imitation. Not quite as cool.